Adding insult to vacuousness was the demographic box-checking nature of the video, however beautifully filmed. Working mom, check. Hispanic entrepreneur, check. Retiring grandma, check. Gay couple, check. African-American family, check. Hardworking small-businessman, check. South Asian, inter-racial, lesbian, check, check, check. If your demographic was not featured, you should write the campaign and it will probably splice you in. As I’ve noted with regard to other candidates, an official campaign announcement is only a beginning. Hillary will likely give voters a lot more substance. At the same time, her cozy ties to Wall Street firms like Goldman Sachs, the enormous wealth of her family, the donors on whom she will rely to fund her campaign, and the Clinton Foundation’s ties to the global moneyed elite make it unlikely that she’ll ever reshuffle a deck stacked to favor those at the top. Absent specific, credible proposals, the rational voter should ignore that pledge. Thus the launch video’s most glaring flaw: When the candidate finally addressed a single matter of substance, she did so in a way that wasn’t yet believable. “The presidency is not some crown to be passed between two families!,” former Maryland Governor Martin O’Malley said recently. He meant, of course, the Bushes and the Clintons who, as seems a really possibility, have governed and will govern the United States from the year 1989 until 2025, excluding an eight-year interruption by Barack Obama. 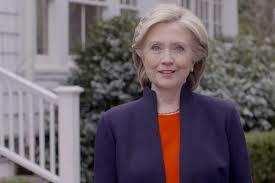 On Sunday that dark scenario moved a bit closer when Hillary Clinton, the wife of former President Bill Clinton, officially announced her candidacy in 2016 presidential election. In her steps will soon follow Jeb Bush, brother and son of two former Republican presidents. O’Malley, though far from objective as he himself is considering becoming a candidate, is undoubtedly correct for many reasons. In recent years much has been said about the growing inequality of the American economy, and how a child from a poor family has less of a chance at social advancement. America increasingly belongs to the millionaires and billionaires. A quasi-feudal system has formed in which the fate of a man and his future position in life are determined at birth. A Bush-Clinton relay would confirm that this unhealthy process is occurring not only in finance but politics as well. Her biggest drawback, and again this is my personal opinion – is not even the fact that she is privileged, but that she considers herself to be. Certain rules that apply to “ordinary people” do not apply because her name is Hillary Clinton. A perfect example is the so called e-mail scandal that broke a few weeks ago. It turned out that when Hillary was secretary of state she used her personal e-mail account. All correspondence was saved on a server that the Clintons had installed in their home in New York. Last year she forwarded to governmental archives thousands of “business” e-mails, but she deleted 30,000 “private” ones – and she was the one who decided which were which. Republicans raised a fuss, suggesting Hillary was hiding something. Jeb Bush brags that he had a business e-mail account and that its contents were revealed on his Web site. Yet that isn’t the root of the matter! After all, Bush had a private account in addition to a business account, and if he wanted to conceal his business matters he could have kept such correspondence in his private account – and he probably did as all politicians do. This all plays into the Republican strategy to portray Clinton as an out-of-touch plutocrat like Mitt Romney. It will be strange to see the Republicans running against the top one percent. The problem is not so much that candidates are members of a family with previous presidents but the two particular families involved. The family business for each has become seeking power and influence peddling. Both the activities of the Bush family and Clinton Foundation create similar concerns. On the one hand this could raise the question of whether keeping the presidency in a single family invites such abuses, but on the other hand it is also possible to have political families who do not engage in the practices of the Bush and Clinton families. Posted in Barack Obama, Hillary Clinton, Jeb Bush, Martin O'Malley, Mitt Romney, Op-eds, Politics, Ronald Reagan, Scandals, Scott Walker. Tags: Hillary Clinton, Jeb Bush, Martin O'Malley, Mitt Romney, Ronald Reagan, Scott Walker. RSS feed for comments on this post.. TrackBack URL. Nate Silver only gives Clinton a 50:50 chance of winning at this point. Beyond his analysis, the bigger issue is that Clinton has a much greater chance of self-destructing, both due to her poor ability as a campaigner and because of being taken down by scandals. I think she is too risky for a major political party to pin their hopes on. It is still a long time until the nominee is chosen. I agree it is a long shot to stop her, but it also looked that way in 2008. It is way too early to concede and support someone I would not want to be president as opposed to pushing for a better Democratic candidate. Once the nomination is locked up, then Democrats can get behind her as being preferable to the Republican nominee.